You wouldn’t necessarily think of the D.C. region as being a hotbed of folk or bluegrass music but Cathy Fink says there’s a lot more than you might guess. Fink says the folk world has always been fine with lesbian musicians and the bluegrass realm is “slowly opening its doors.” Fink has released about 47 albums over the years. Her latest, “Shout and Shine,” was released in summer 2017. Find out more at cathymarcy.com. Fink moved to the D.C. area in 1979. She and Marxer live in Silver Spring, Md. 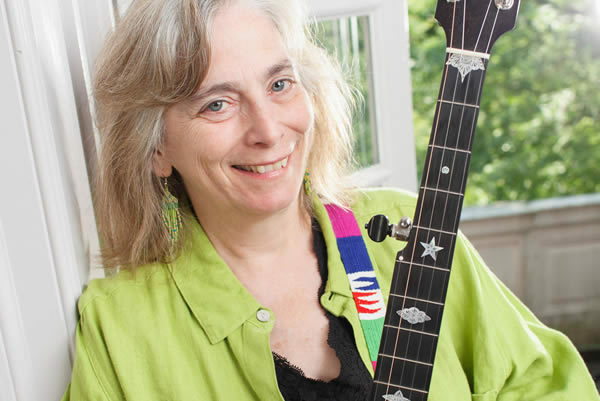 Fink enjoys music, quilting, writing short stories, hiking, cycling and volunteering in her free time. Marcy and I have been together for 35 years. The hardest person to tell was probably my mother. She, like the rest of my family, easily saw how amazing Marcy was and those still alive are still crazy about her. Who wouldn’t be? Wow, there are many. Cleve Jones’ brilliance in starting the AIDS Memorial Quilt was a huge inspiration. I wrote five songs about the quilt. Holly Near sings loud songs that question, educate and inspire us to action. Concert halls or theaters such as Round House Theater, The Birchmere, AMP by Strathmore, Strathmore Mansion, The Hamilton, Woolly Mammoth or even a local summer park show. I had my dream wedding. Marcy and I had a two-hour wedding and the party was part of the ceremony with several musical friends performing. It was happy, profound and an extension of the commitment we had already made to each other. There are so many. We have always been passionate about helping children and families. Tomorrow I’m volunteering at Nourish Now, a Gaithersburg food pantry. I’m also passionate about mentoring the up-and-coming musical generations and volunteer a lot of time doing that. I’m most passionate about the thing I’m currently doing, whatever it is. Trump. Over and out. And out the sooner the better. My first big folk music concert was Pete Seeger and Arlo Guthrie in Montreal. It was amazing and opened my eyes to the wide word of audience engagement, social justice in music and the simple concept of putting on a great show as a folk singer. I later got to work and record with Pete Seeger and have shared a few stages with Arlo. Thrilling! I posted about yesterday’s Women’s March, including a few favorite signs. And today I posted about local lesbian songwriter Crys Matthews’ brilliant concert in honor of Martin Luther King at the Reston Community Center. I loved and lived with a male partner for five years. When that was over, it never occurred to me to think of myself as a lesbian. When I fell in love with Marcy, I had to come to terms with recognizing a love that would take some adjustments on my part in thinking about who I was. Honestly, I don’t think hard about whether I am this label or that label. I understood that I was one half of a magnet and she was the other half and we have lived happily ever after. I wouldn’t change a thing for myself, but I would be supportive of people who understood that they needed to make a change. I believe that energy is neither created nor destroyed. I believe in karma, but have no clue how it works. I believe I have met people that I was closely associated with in other lives or times. I believe there is some form of energy out there we can all contribute to. Remember that music has powered many a great movement. “We Shall Overcome” went from hymnals to tobacco workers to the Highlander Center to Guy Carawan to Pete Seeger to the world and it still powers movements. There are a lot of us out there ready to support events and communities. “Cloudburst” with Olympia Dukakis and Brenda Fricker (2011). And the closing song, “Ain’t Life Sweet” just happened to be by a friend of mine from Canada, Penny Lang. Changing the fork from left hand when cutting food to right hand when eating it. It is strictly an American thing and hopefully, a custom long done. But too late, my parents insisted I do it and I can’t help it. Last weekend, I was in the studio in Raleigh, N.C., mentoring two 16-year-old musicians. They are both awesome and they both stepped right up to the plate creating some amazing tracks. That’s the best reward I can possibly get is to see and hear that magic. But I ain’t telling you that I ain’t proud of my 14 Grammy nominations and two Grammy Awards! Or the blue ribbon first place in the clawhammer banjo competition at the Appalachian Stringband Music Festival last summer. I wish I’d known all kinds of stuff that no one in my family would have known how to talk about like social justice and activism. Friends and music. We also spend time in Lansing, N.C., and have built another community of friends, musicians and co-workers there.